We’ve been in Chiang Mai for nearly 3 weeks now. We’ve rented a house and a car, hired a nanny and figured out where to buy the basics. It feels like we’re in a strange phase between complete newbie and cool, collected resident. We thought we’d share our musings on weird and wonderful Chiang Mai before it all feels like the norm. Thai’s seem to love their gadgets and utensils. There seem to be whole aisles devoted to things that I’d never even dreamed of. It’s possible I’m going into stores I’d avoid like the plague back home. There’s an odd phenomenon that happens to me when I travel. My ability to separate out the good shops from the bad entirely disappears. Suddenly I find yourself drawn towards utility closets, banks and kitchenware stores as if they’re the most interesting thing in the universe. I go in. I browse for a while. Then there’s a realisation of where I am. By this point a staff member is smiling at me welcomingly. Sometimes they even approach to help me with my purchase of a novalty kettle or animated mop head. Introvert that I am, I panic and run. This happens quite regularly when I travel. So I guess it’s no wonder that I ended up with triple bladed scissors in my kitchen cupboard. 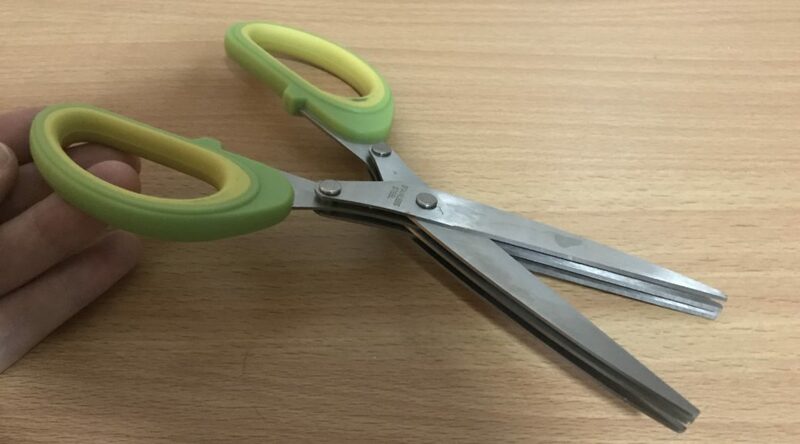 I actually bought these, thinking they were normal scissors. Imagine my dismay when I opened them. All those extra blades when I was only expecting two! It felt like something out of a horror movie. This brings me to my next weirdness. 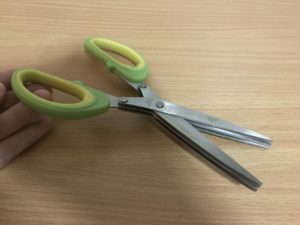 Could I have returned the silly scissors if I hadn’t accidentally opened them? Nope. Because in Thailand you can’t do refunds if you use card. Refunds in general are unusual here. Most shops will have signs asking you to check purchases before you pay as there are no refunds. However, the real problem with refunds on card purchases just seems to be that no one knows how to do it. I would think that it’s a conspiracy. Don’t teach the staff how to work the cash registers, then people won’t be able to return purchases. But it happens even in the chains, where you’d think they’d have better customer service policies. Maybe it’s just that refunds in general are not the norm. Remember how I mentioned that I didn’t realise the scissors had 3 blades until I opened them? Well, that’s pretty normal here. Everything, and I mean everything, comes wrapped in plastic packaging. If it doesn’t come wrapped in plastic packaging, they make sure to put it in it’s own bag before they give it to you. I can understand plastic packaging when it comes to food – there are a lot of ants here after all. But tupperwear containers? Children’s toys? Books? We’ve even seen markets where they wrap food in banana leaves (great). But then they put the banana leaves into a plastic bag once you buy them. Sigh. Probably 50% of new books that I’ve seen here come packaged in plastic. As well as making it really difficult to decide if the book is suitable for your two year old it’s also a little depressing. I try and be green. But it makes me wonder what good my attempts to be eco friendly do when there’s so much commercial waste. When you become a resident in Thailand, you need a ‘Thai Residence Certificate’ in order to do official things like open bank accounts. You’re supposed to go to the official building, give them your documentation along with a photo. It then takes 30 days to get the document back. In the past, you were able to slip the staff 500 baht (just over £10) to get it back the next day. However, the powers that be cracked down on that. So what did they do? Create an unmarked, unofficial, underground office where you can get the same next day service for…you guessed it…500 baht. You literally have to go into the unmarked store next to the copy shop. Here you will find 2 guys and a photocopier. You give all your documentation to guy no.1 along with your photo and 500 baht. The next day you come back to guy no.2 and ‘voila’. Official document that should have taken 30 days to process. Scary? I thought so. My husband, however, thinks it’s awesome. I quote ‘you throw a bunch of money around and things happen’. Which brings me to my next observation – money really does make the world go round. It’s much cheaper to transfer money to Thailand if you can get a Thai bank account. Then you can use WeTransfer, which is one of the cheapest ways we’ve found to get funds in local currency. At the start of our trip we struggled to open the bank account. They wanted the document mentioned above, which we though would take 30 days to get back. Some would only open accounts for Thais. Others wanted you to prove that you were going to live here for 1 year. Eventually, Karl read that if you went to the bank with a stack of money that would…move things along. We didn’t want to believe this was the case – you do hope for some sort of official policy from a bank, after all. But of course, it turned out to be true. Karl decided on a whim to try it out. He went to the bank dressed in trousers and a shirt (he’d gone in shorts and a t shirt the previous time). And he clipped a stack of 10,000 baht (£230/$300USD) to the front of his documentation. The staff couldn’t take their eyes off it. In no time at all we had a Thai bank account, a shiny new ATM card and a free t shirt to go with it. We figured that once we had our Thai bank account and card we’d be able to…Oh, say, pay for things with it. Apparently this isn’t actually what bank cards do in Thailand. Bangkok bank, where we have our card has just made a deal with union pay. So all of their banks are pushing this union pay card onto their customers. Union pay is a new payment system in Thailand. They’re trying to do deals with all sorts of providers. Trying being the operative word. They haven’t actually done these deals yet. Nowhere takes union pay cards. So after paying £20 for this bank card (all bank cards cost money here), we have one option for how to use it. Take money out of the bank and then go do our shopping with it. But that’s just union pay, I hear you cry. Get a sensible card and you’ll be fine. Well, yes, we could pay another £20 and get a different card. After opening a second bank account. Because Bangkok bank only does union pay cards. And then it *might* work in shops. Sigh. However, that doesn’t solve the issue of online shopping. Most Thai websites won’t take debit or credit cards. Yep. That’s right. You can’t use debit or credit cards on the internet. The internet. The digital internet. The internet that practically screams ‘use a debit or credit card’ on me. For most Thai websites, you put in your order and then transfer the funds directly to their account. 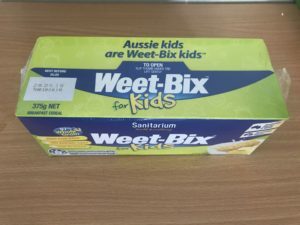 You then email them to tell them you’ve done it and then send you the product. How anyone manages to buy anything without being scammed I have no idea. The laid back approach here doesn’t just happen in banks and government buildings. The driving here is some of the most chillled I’ve ever experienced. People will weave across the road on motorbikes, looking at their phones. After having waited 6 1/2 minutes at a red light (yes, you heard me right – 6 1/2 minutes – I timed it), the cars will wait a bit, collect their thoughts, possibly meditate and only then start driving. It drives (hahaha) us impatient foreigners insane. After waiting 6 1/2 minutes for a red light to change we’re chomping at the bit (or revving at the engine, I suppose). But the Thais are just so zen about the whole thing. It’s definitely better. Road rage is awful. But, man, is it annoying when you’re stuck behind cars and trying to get through a light! Ok, so you’ve already read about this one in the post above. But I think it deserves it’s own bullet. 6 1/2 minutes on red!!!?! Gah! Everyone drives. You’ll see families going on motorbikes – dad on the front, mum on the back, kid in the middle. It’s a little scary. But then, so is attempting to walk anywhere in Chiang Mai. We ended up crossing over 4 lanes of traffic and a barrier to get to the pavement on the other side. Did I mention with was with 2 kids and a double stroller? Never again. This post has been a little more negative than I intended (Chiang Mai is awesome, promise!). One of the things that’s great about it is the amazing service you get everywhere. The flip side of lack of infrastructure is the ability to get personal service. Everything from buying a tailor made suit to getting your internet set up feels like it’s being done just for you. 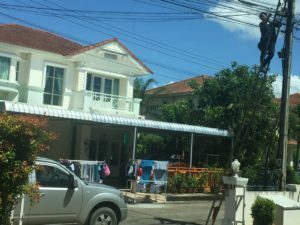 When we set up our internet, we initially what the 2400 baht set up fee was for. That was until two guys arrived at our house, went down the road to string up a new fibre obtics cable to the main power lines, and then drive it back to our house and set it up. Its a far cry away from the response you’d get back home. So, hope you enjoyed reading and greetings from Thailand (sent from my home with it’s super-fast-internet).